How to backup iPhone on Windows 10/8/7 is generally believed to be an easy process, but with any little misstep, you’ll end up battling with iTunes errors and issues. What then should you do to ensure a smooth back up of your iOS data? The simple answer is to follow this article and adopt our tips in backing up your iPhone. More so, if you encounter an iTunes error while transferring your iOS data to a PC via iTunes, what can you do to repair or fix iTunes? This post will also cover for such mishaps by introducing you to an iTunes repairer tool for fixing iTunes issues and errors. Part 2: What If iTunes Can’t Back up iPhone on Windows 10/8/7? 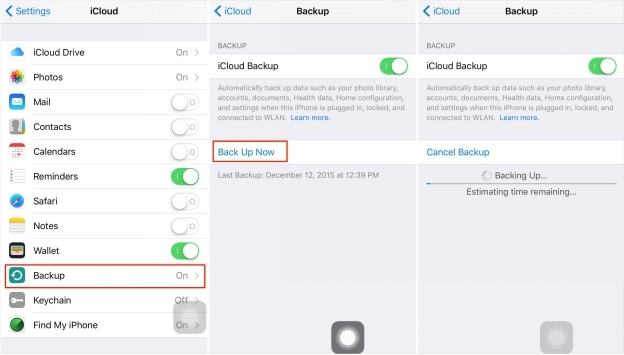 Back up your iPhone, iPad or iPod touch on a Windows PC or iCloud by following the steps of these backup methods shared below. Backing up iPhone to iTunes Windows means copying certain files and settings from your iOS device to your Windows computer. Using iTunes to back up is one of the best ways to make sure you don’t lose the information on your iOS device if misplaced or damaged. It’s also useful to transfer your files, data, and settings when you buy a new iOS device. Step 1: Launch iTunes on your PC, and connect your iPhone to your PC using Apple’s original USB cable. Step 2: Click your iPhone icon on the top-left corner of iTunes windows. 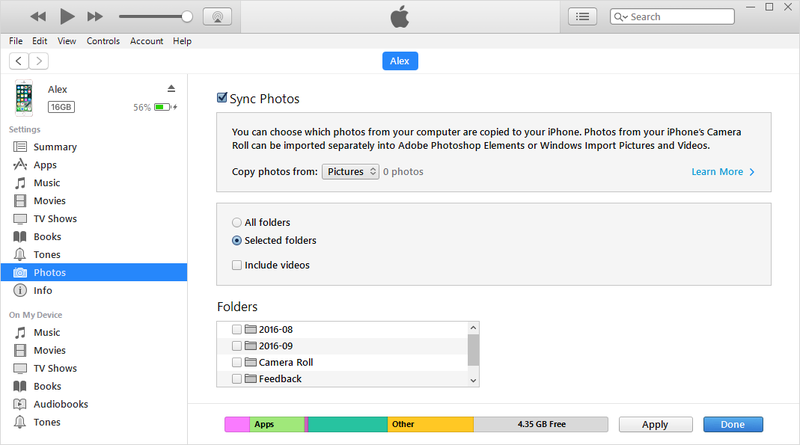 Step 3: Click “Photos” on the left side menu, and click the checkbox next to Sync Photos. Step 4: Repeat step 3 for Music, TV Shows, Movies, etc. Step 5: Click “Apply > Sync” to complete the process. Step 3: Click “Summary > Back Up Now”. The iTunes automatic back up method can back up information such as text messages, photos, videos, music, notes, call history, contact favorites, sound settings, widget settings, and more. Step 1: Connect your iPhone to Wi-Fi or WLAN network. Step 2: Go to “Settings” on your iPhone and click on it. 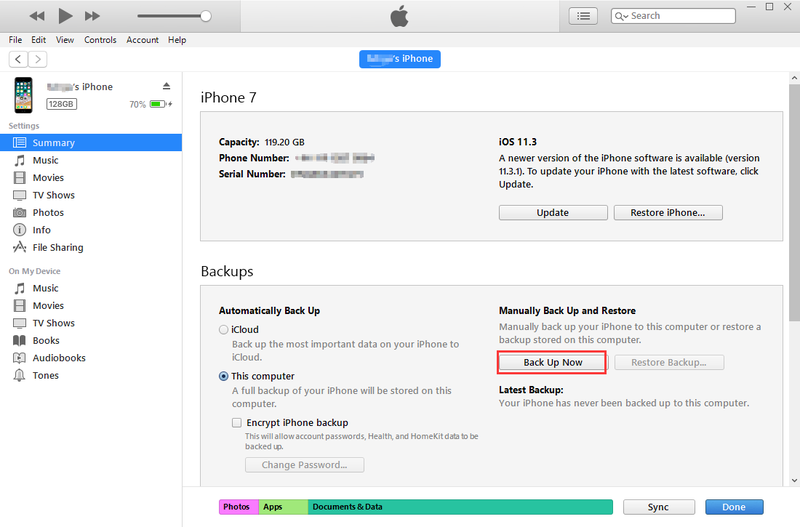 Step 3: Click “[Your name] > iCloud > iCloud Backup > Backup Now”. Step 4: Plug your iPhone into a charging source. What If iTunes Can’t Back up iPhone on Windows 10/8/7? Several errors can occur while using iTunes to back up iPhone, iPad or iPod touch. The fix and solutions for these iTunes errors and issues are listed and discussed in this section of the article. 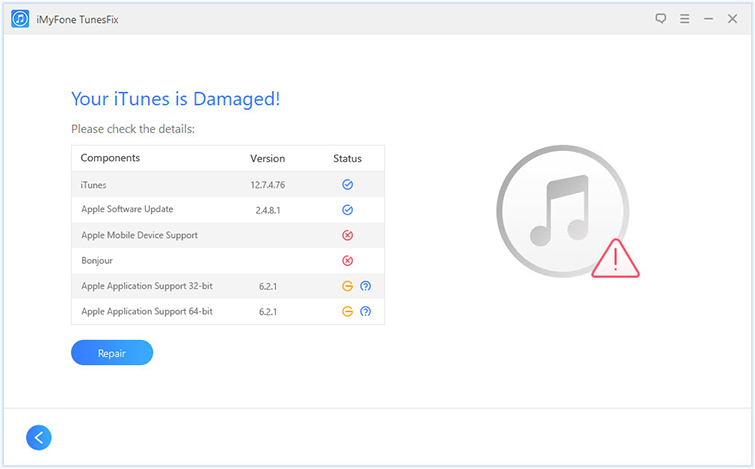 iMyFone TunesFix is an iTunes repair tool that serves the primary purpose of fixing all iTunes errors and issues. If you cannot backup iPhone to iTunes, then you can employ TunesFix to repair your iTunes and fix the problem. iMyFone offers you an advanced tool for fixing iTunes back up issues and errors. You can auto-detect iPhone and iTunes restore/backup issues using TunesFix. TunesFix one-click feature can fix all your iTunes errors and issues just in one click. TunesFix offers you features such as Auto-Detect iTunes Issues, One-Click Repair, No Data Loss, and All iTunes Errors Supported. Step 2: Choose a repair mode (in this case, you have to choose “Repair Backup/Restore Errors”). Step 2: Go to the Menu bar at the top of iTunes window, click on Help > Check for Updates. Step 3: Follow the prompts to install the latest version of iTunes. Step 1: Plug your device into a power source and connect to a Wi-Fi network. Step 2: Go to Settings > General > Software Update > Download and Install. Step 3: Click on Install, and then enter your Passcode to continue. When your update is ready, your iOS device will reboot automatically.